Once you file an income tax return the Income Tax Department processes the return and sends an intimation. The intimation contains details of the return submitted by you and the numbers that the department has. 2. Agree with the demand and pay the tax. What Errors can be corrected by filing a Rectification? A rectification request under section 154(1) is allowed by the Income Tax Department for correcting mistakes when there is an apparent mistake in your Income Tax Return. an error due to overlooking compulsory provisions of law. Do not use rectification request for changing bank account or address details of your Income Tax Return. When can rectification be filed? A rectification request can be filed only for returns which are already processed in CPC, Bangalore. If on rectifying a ‘mistake’ there is a change in Income – a rectification should not be filed. In this case, a Revised Income Tax Return should be filed. No new deductions or exemptions are allowed to be claimed. Who can file the Rectification? A rectification can be filed by you or an Income Tax Authority can on its own rectify a mistake which is apparent. Should Rectification be Filed Online? When the Income Tax Return was filed online an Online Rectification has to be filed. How to File a Rectification Online? Step 2 – Go to ‘e-File’. In the drop-down select ‘Rectification’. Step 3 – Select the ‘Assessment Year’ for which rectification is to be filed and ‘Latest Communication Reference Number’ (as mentioned in the CPC Order). In case you have received more than 2 orders use the latest order number. Click on ‘Validate’. Step 4 – Select the ‘Rectification Request Type’ based on the reason for filing rectification. A. 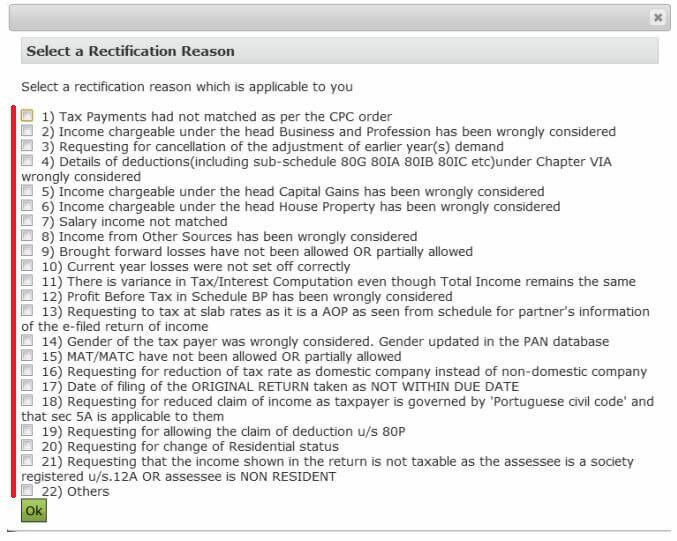 ‘Taxpayer Correcting Data for Tax Credit mismatch only’ − On selecting this option three check boxes are displayed. You can make a correction to Tax Collected at Source (TCS), Tax Deducted at Source (TDS) and Income Tax (IT) entered in the Income Tax Return. You may select the checkbox for which data needs to be corrected. You can add a maximum of 10 entries for each of the selections. B.’Taxpayer is correcting the Data in Rectification’ − Select the reason for seeking rectification and the Schedules in the return being changed. Next, you need to upload XML. You can select a maximum of 4 reasons. C. ‘No further Data Correction required. Reprocess the case’ − You can select this option if there is a Tax Credit Mismatch or Tax/ Interest mismatch. You may select the checkbox for which reprocessing is required. No upload of an Income Tax Return is required. Step 5 – Click the ‘Submit’ button. A pop up will appear to make sure that the TDS entries are as per Form 26AS. Click on ‘OK’. Step 6 – On successful submission, a Reference number is generated and sent for processing to CPC, Bangalore. 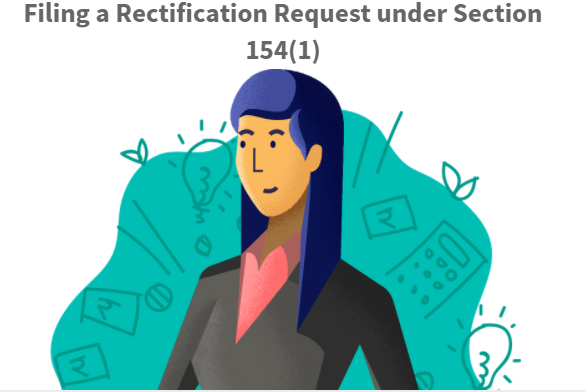 After processing the Rectification Request, the rectification order under Section 154 will be issued.